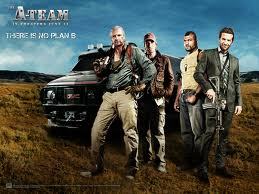 Who does not know the movie called "The A-Team", one film that should not be missed. Film down which tells about the character of mercenary super crazy. The army is at the front boundary of the country while at war. These soldiers were bravely risked their lives for the safety of the entire nation after the war but unfortunately, not many people who still remember their merits. Instead they must continue the struggle again because after the end of their task, not much you can do this the war machine. The same fate also experienced by four veterans of the Iraq war who finally decided to become a mercenary is. John 'Hannibal' Smith (Liam Neeson), Templeton 'Faceman' Peck (Bradley Cooper), BA 'Bad Attitude' Baracus (Quinton Jackson), and HM 'Howling Mad' Murdock (Sharlto Copley) is a former American soldier accused of crimes they never did.